In Michelangelo Antonioni’s fantastic, moody, exquisitely slow and sensuous sixties film Blow Up a photographer (David Hemmings) takes a photograph in a park and later, when he develops his film, sees that he has captured something mysterious in his shots; a murder no less. 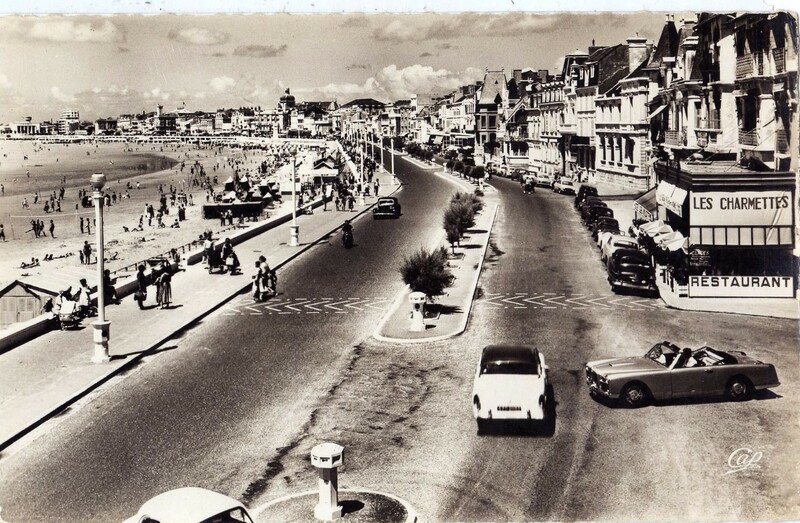 In this postcard of Les Sables-d’Olonne too we have something revealed. I bought it for the Facel Vega; rare rare rare even in its day. If you follow my other blog Beambreaking, you’ll know that I saw a Facel Vega only last weekend at Silverstone. That one was a 6.3 litre 1959 HK500 coupe. The one on the postcard is an FVS, distinguishable from the HK500, which superseded it in 1959, by its conventional windscreen (rather than wraparound panoramic) and its two headlamp design as opposed to four. This might be the rarest car ever on this blog because, as far as I can tell, only six convertibles were ever made. Six! And one gets caught in a postcard! Initially I thought it was edging out of the side street into the main seafront road at Les Sables-d’Olonne, waiting for the opportunity to cross the traffic and turn left. Then I realised the driver had braked hard to avoid hitting that white Simca Versailles Ariane which had probably just came around the roundabout, hence the driver not seeing it in time. How do we know he is making an emergency stop? Look at the passenger. She has been thrown forward and seems to have hit her head on the windscreen! Wow that probably hurt! The days before seat belts. Another possibility is that it is a little girl standing up, but my feeling is that we should see her hands on the dashboard if that were the case. Anyway, I don’t see the owner of that car having a little girl with him. Either way, as in Blow Up, it’s an image that you just can’t let go of. Talking of accidents and Facel Vegas and artists… Albert Camus came to an absurd end in a Facel Vega HK500 in 1960. He broke his neck when his head hit the boot lid after being thrown from the front passenger seat out of the back window. (Though when you look at the wreck, I’m not sure how they arrived at that conclusion). He had a train ticket in his luggage but had changed his plans at the last minute when his publisher offered him a ride in his HK500. It’s written up in some detail here – Albert Camus’ Crash. Anyway, my postcard was posted in 1962 (I can’t make out the exact date). The message is – “Amicales pensées des sables” (Friendly thoughts from the Sands) and it was sent to a Mr & Mrs Michaut at the Boys School in Champcevrais (France). I don’t supposed either the sender or the recipients saw that Facel Vega.